TTNITED STATES DEPARTMENT OF ARCrULTTRE AGRI CUTJTRAL RESEARCH ADMINI STATION BUREU OF ENTOMOLOGY AND PLANT qJUARANTINE Washington 25, D. C.
the movement of plants entirely within the State. of Plant Industry, State Department of Agriculture, Boise, Idaho. of Entomology and Plant Quarantine, Washington 25, D. C.
sale or propagation or collected in the wild, except field, vegetable, and flower seeds. Definition of Florist's Stock.--Cut flowers, foliage, f-rn:, potted plants, cutting or bedding plants; flowerin, bulbs n.' rot d herbaceous plants used for ornamental or decorative purposes; ani-I corms, hoIever grown, or cuttings thereof. fee of $15 for his principal place of business anI obtain a separate license, for the same fee, for each sales branch of his business, exclusive of growing grounds or greenhouses. Aelicants dealing in fruit stock or fruit seeds must pay the license fee and also file a bond of $1,000. Applicants with an annual business grossing 7200 or less must pay a fee of $5 per year. The fee for each agent's license is $1 per year. No license is required in the case of persons not re.gu1arl; engaged in the nursery or florist business, provided his total amount of gross annual sales does not exceed 050. All licenses expire ol June 30 following date of issue. It is unlawful for any nurseryman or florist to sell or furnish any nursery or florist's stock that is misrepresented as to true name, age, and variety. Any shipment of nursery stock into Idaho is subject to insoction, whether or not accompanied by an inspection certificate of the State of origin. In case of shipment of nursery stock into the State by any person not licensed to do business in Idaho the consignee must have such nursery stock inspected and must pay an inspection fee of 10 percent of the invoice value of such shipment. It is the duty of transportation companies to notify the insp-ctor of any district to which nursery -tock is shipped from outside Idaho and not to release such shipments of nursery stock until they ar- inspected. will bc, n,,imitt r! into I,'--,lho onl-, when accoy,-,panio b offic4p.1 certificration at point of ori. ;in of havinI7 b,-Ien -' ,rcl--n in, in, onl from a counter free from cherry fruit flies. end. New Mexico, and from San Joaquin Coun ty Califoria. nuts reship-.ed into or arriving in Idaho in unopenned, original co.ntainers. All berry plants moving into Idaho from oth-er S'atc.s m111ust be accomnpanied by a certificate of thc tt of origiJn ehw~gthat tuh(e shipment has beEn inspected an,! foun-fr, from crown or canle call. No varity of hop plants or h-Io-p rooIts will he arl-itterl into Id~alho from Ore 'on- or from the counties in Wfashington west of the Ceas)de Moutain..
Stalks, ears, cobs, or other parts of corn, broom corn, sorghums, and Sudan grass (except clean seed and shelled grain), as such, as packing, or as seed-contamination refuse, will not be admitted into Idaho from the regulated areas unless each shipment or lot is accompanied by a certificate signed by (1) an inspector of the Federal Sur:a.u of Entomology and Plant Quarantine certifying that such shipment has been treated under his supervision in such manner as to eliminate the borer, or (2) an official of the State of origin certifying that the shipment has been treated under his supervision by a method approved by the I.aho Department of Agriculture, and giving details, date, and place of treatment. Cut flowers and entire plants of aster, chrysanthemum, dahlia, and gladiolus (except corms, roots, bulbs, or tubers without stems), lina beans and green shell beans (cranberry or horticultural) in the pod, beets with tops, and rhubarb (cut or plants) grown in or shipped from the regulated areas will not be admitted into Idaho unless each shipment or lot is accompanied by a certificate signed by a State or Federal inspector certifying that the material in such shipment has been inspected and found free from the borer; except that cut flowers and entire plants or chrysanthemum, and rhubarb (cut or plants), if propagated and grown in a greenhouse located within the regulated areas, will be admitted into Idaho when so certified by an official of the State of origin. No restrictions are placed upon the movement of tho restricted products when they halve been processed or m'.nufacturcd. tlack locust plants, untreated black locust products, and any other materials capable of transporting the locust borer may not be transported into or through IIdaho unless accompanied by certification of the State of origin that such stock has been furiigated in an approved fumiga.tion chamber using the Posage schedule specified in the quarantine. The certificate must also state the date anI details of treatment, point of shipment, and names and addresses of consignor anO consignee. A copy of such certificate must be mailed at time of shipment to the Director, Bureau of Plant Industry, Boise. products from the infested district (all States east of the eastern borders of Arizona, Utah, Idaho, anI Montana, and the entire State of Washington) such shipments will immediately be sent out of Idaho or destroyed, all expenses incurred to be paid by the consienee or owner. gr,)wn, points of Phipment nnd delivery, and n,,.i:-(%s ant aldirc ss,--s of' c,,))-Isignor and coIIS1*,-,n'--'E,, A copy of suolh ccrtif'.catc. !ru5 t be mail,,,d advrmc,., of si-ipment to the Commissirr., -.r (,,T -,,c,;se. U.S. Deuartment of A,-riciiltur e 4 n IA ,.ho or to exp rinlcnts of t"10 'Depr)rtment of Fatholo-y, Univorsity of Idaho. Restricted articles.--Trees, cuttings, grafts, scions, or buds of all species and varieties of almond, apricot, nectarine, peech, and plum, including the flowering forms, and any trees budded or grafted on pearch stock or oench roots. Conditions governing shipment.--The restricted articles may not enter Idaho from the infected area unless certified as described below. Conditions of certification.--When it has been determined by adequate annual Federal or State surveys, satisfactory to the Idaho Commissioner of Ariculture, that counties within an infected State arz dis ase-free, restricted articles originating in such counties will be admitted into Idaho, if each shipment is accompanied by certification of the State of origin that the restricted articles were produced in such disease-free counties from disease-free bud sources anr rootstocks, and in diseasefree environs. The certificate must also state the names and addresses of shipper and consignee, the number and kind of restricted articles in the shipment, and the area where grown. A copy of such certificate must be forwarded at time of shipment to the Commissioner of Agriculture, Boise. These restrictions do not apply to experiments of the U.S. Department of Agriculture in Idaho or to experiments of the Department of Pathology, University of Idaho. Peach or nec-.arine roots, or peach or nectarine trees with roots, or any kind of trees grafted on peach or nectarine roots may be transported from the regulated areas into, within, or from Idaho only when accompanied by a nursery certificate or permit of the State of origin. Each shipment of potatoes moving from the infested area into Idaho must be nccompanied by (1) State-of-origin certification at point of origin thaVt the fields in which the potatoes were grown were inspected and found apparently free from potato tuber moth, and the potatoes were inspected when ready for shipment and found free of the pest, or (2) certification of the State of origin, or of any State outside Idaho, that the potatoes were fumigated according to prescribed methods and dosages. Such certificate must also state th; shipping point, dates of inspection and fumigation, number of containers in shipment, car name and number, and namcs and addresses of shipper and consignee. A copy of the certificate must be sent to the Furenu of Plant Industry, Boise. Each container of potatoes, when reshipped in broken lots of less than the original carload lots, must be plainly labeled with a tag showing the State or Territory of origin, the shipping point, and the serial number of the certificate issued on the entire lot. from satin moth. If the articles in such shipment were grown in a county free of the pest but were stored in the infested territory, the certificate must state that all such articles were stored in a storage free from poplar or willow traces or parts thereof from infested territory. "Certified Seed Potatoes," according to the requirements for certification in the State of origin. No certified seed potatoes infected with bacterial ring rot may be shipped into the State. The above summary was chec-ed and approved on August 16, 194s, by Wilson Kellogg, Dirvctor, Bureau of Pixnt Industry, Idaho Department of Agriculture, with respect to the quarantines and r(gulrtions then in effect. -ll field-grown florists' stock, trees, shrubs, vines, cuttings, grmfts, scions, buds, fruit pits, and other seeds of fruit and ornamental trens or shrubs, and other plants and plant products for propa ation, including strawberry plants (except field, vegetable, and flower seeds, bedding plants and other herbaceous plants, bulbs, and roots), may be admitteK to the mails only when accompanied by a State inspection certificate to the effect that the nursery or premises from which such stock is shipped has been inspected within a yiar and found free from injurious insects and plant diseases. Parcels containing such nursery stock must be plainly marked to show the nature of the contents nnd the name and address of the sender. (Postal Laws and Regulations 1940, sec 5?5.) Inspection and certification must be done by a plant quarantine official of the State of origin. An individual mailing of such plants or plant products, if from uninspected premises, will also be accepted upon examination and certification by a State plant quarantine official. 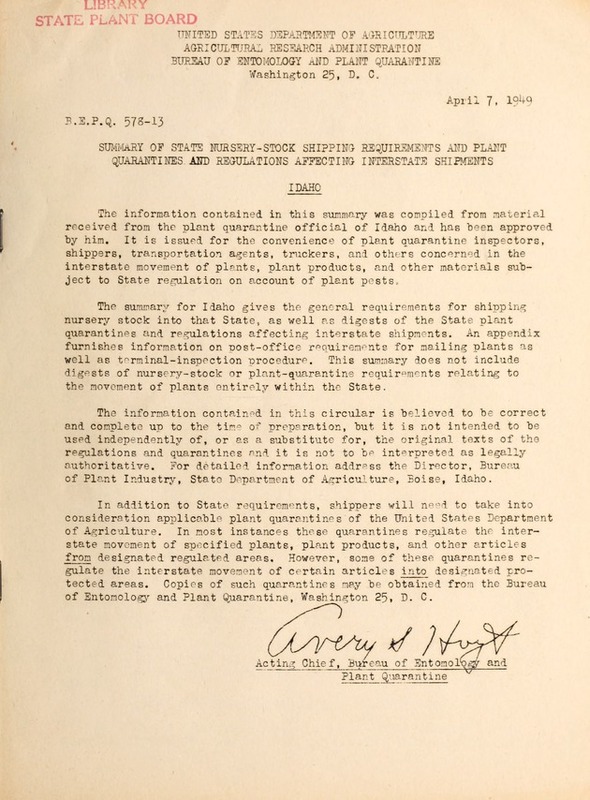 The address of the Idaho plant quarantine official is given in the preceding summary. Establishment of Terminal Inspection.--Any State desiring to operate under the provisions of the terminal inspection law so as to regulate the movement of mail shipments of plants and plant products into (or within) the State may, after having provided therefor at State exepense and having designated one or more places where inspection will be maintained, arrange to have such mail shipments turned over to State plant quarantine inspectors for examination at designated inspection points. Application will be made to the Secretary of Agriculture by submitting a list of plants and plant products and the plant pests transmitted thereby, which are to be examined. The list, when approved in whole or in part, will be transmitted to the Postmaster General whereupon postmasters will be informed and instructed. Anyone mailing a parcel containing any plants or plant products addressed to any place within a State maintaining terminal inspection thereof is required, under the law, to have the parcel plainly marked on the outside to show the nature of the contents. Materials shipped under Federal quarantine certificates issued by the Bureau of Entomology and Plant Quarantine may re exempted from terminal inspection at the option of the receiving State. into (or within) the State of mail shipments of designated plants .nd plant products the movement of which would constitute a violation of State plant quarantine laws or regulations. Terminal Inspection Procedure.--Upon arrival in any State maintaining terminal inspection, plants or -olant products named on the approved list will be forwarded by the postmaster at destination to the nearest inspection point. If the plants or plant products are found, upon inspection, to be free from injurious posts and not in violation of any plant quarantine or regulation of the State of destination or the United States Department of Agriculture, or if disinfested when they are found infested, such plants or plant products will then be forwarded by the postmast .r at the point of inspection to the addressee upon payment of postage. If plants or plant products, upon inspection, are found to be infested with injurious pests and cannot be satisfactorily disinfested, or are in violation of any plant quarantine or regulation of the State of destination or the United States Department of Agriculture, the postmaster upon notification by the State inspector will inform the sender that the parcel will be returned to him upon his request and at his expense. In default of such request the parcel will be turned over to the State authorities for destruction. Terminal inspection of plants and plant products' is now maintained by Arizona, Arkansas, California, District of Columbia, Florida, Hawaii, Idaho, Minnesota, Hississippi, Montana, Oregon, Puerto Rico, Utah, and Washington. Plants an, plant products subject to terminal inspection and places where terminal-inspection service is maintained are listed at the end of the summary of the general nursery-stock shipping requiremonts for each of the above-mentioned States, District, and Territories. addressee may arrange with the sender to place on the parcels a pledge reading, "Forwarding postage guaranteed," whereupon the additional postage for forwarding will be collected from the addressee.